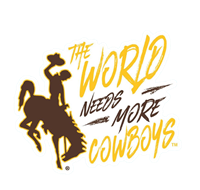 University of Wyoming "The World Needs More Cowboys" long sleeve tee. 100% cotton. Screenprint graphic. *Saturday hours are subject to change.